Mei Wang: To be honest,I don’t think some of these are hanfu. As you can see, some of those 交領上襦 don’t have the front 中縫 and 接袖, even a white one with black bamboo on it has such bad sleeves. You may notice a few of the photos showing that the collar is too broad. The 內襟 should be shorter than the 外襟; they are not symmetric. Tyler Vipperman: Well, I don’t even think they called it Hanfu in the first place. It’s just their design based off of Hanfu mixed with other types of clothing. It’d be better to just focus on Hanfu as there are an abundance of styles fit for any occasion already. Tyler Vipperman: Yeah, I said that. Tyler Vipperman: Well, I’m just a person with a strong cultural backbone and doesn’t see any point in changing the way I dress, nor do I have any interest in changing the way I dress. The two will just have to co-exist. The world is just becoming more and more uniform…do “Chinese”, “Korean”, “Japanese”, etc, even hold meaning anymore? Tyler Vipperman: Well, as long as I have a few brothers and sisters to share my dreams with, then it’ll be fine. Mei Wang: Just wanna say, for beginners, this type of clothing may be so confusing. They looks similar to hanfu but actually they are not. We may have a responsibility to help each other to distinguish which is or which is not hanfu. Tyler Vipperman: That’s true, Juni. Juni L Yeung: So I suppose the difference between “period specific designs” and “just bad design” — is a matter of basic metaphysical design principles, merged in with practical, ergonomic issues about making that clean, comfortable wear? Tyler Vipperman: Yeah, I don’t really like the Ming design. Feels too tight and constricting…earlier, more loose designs are a lot more comfortable. Tyler Vipperman: I agree with that. Perhaps the Hanfu I wore wasn’t made with comfort in mind. I still don’t like the shortened lapel. It just doesn’t feel as secure, but I suppose it uses less fabric? Ng Vincent: You need a sticky on Xingzhi Juni L Yeung, be nice for everyone to be able to read, and maybe even review every once in a while. And also less arguments (like me for example) Problem is one also needs to identify the different dynasties styles so one isnt too stuck with a single dynasty too. Juni L Yeung: Ng Vincent: If I could, I would. The problem with even ATTEMPTING an essay on that subject would mean that it’d end up looking like a critique on Frankfurt School ideas on cultural production. I’m NOT ready for writing something like that yet. Tyler Vipperman: Just take your time, Juni. These things are really difficult and can take YEARS to complete. The thing is with us saying what is not hanfu or not, sure one can spot a movie hanfu with little to no training. Tyler Vipperman: Well, the biggest problem is that people don’t understand why Hanfu is the way it is. Once you start wearing it on a daily basis, you’ll start to understand why it is what it is. Eventually, you won’t want it to be any other way. People who wear it for fun or only for festivals will think it is inconvenient/uncomfortable, and that’s because they grew up wearing t-shirts and shorts. Juni L Yeung: Ng Vincent: The problem is, even at its “source” language, there is no satisfactory explanation or answer with what Xingzhi is. Hence the miasma of controversies about what “modern hanfu” is, is all about. It took us a decade to sort out the basics (ie. yi/ku/qun-shang/shenyi etc.) and spread that message. Imagine how much longer it’ll take to comb out the issue of stylistics, let alone establish a convention for that (if ever). I myself am ok with the top four myself. Juni L Yeung: ^ See, that would exactly infringe upon the mission of the “modern hanfu,” trying to de-imperialize the hegemony of dynastic historicization. It’s a temporary solution that we’re using for now, but we’re nowhere near satisfied with that system. Tyler Vipperman: I don’t know what you’re talking about, but, Hanfu is Hanfu. We’re trying to get rid of this “dynasty” stuff. There are designs that originated in certain dynasties, however, they shouldn’t be labeled as such. There are a lot of Hanfu styles which have been worn in every Han-lead dynasty as well. Juni L Yeung: This deserves its own thread. Perhaps we should move off this thread to discuss in more detail? Tyler Vipperman: It certainly is an important topic. Juni L. Yeung: This is a DARN old article by now. In this essay I talked a little about the future of hanfu design, in terms of dealing with outside (read: Western) influences and avoiding the essentialization of “Han elements” in similitude of the Qipao’s exercise of self-exoticization. What is NOT discussed here, is Hanfu’s self-Orientalizing, self-Imperializing tendency with dynastic classification and periodization. This has been a major roadblock in dealing with the category of the ‘modern hanfu’ as a system of objects, as the language for it is nonexistent. Let us begin talk with these two major themes in mind. Tyler Vipperman: Well, first question: did the ancients classify their clothing based on the dynasty? Tyler Vipperman: It’s certainly a difficult thing to talk about, as modern Chinese people’s clothing standards have changed immensely since the Manchurian takeover of China. And now in the modern world, convenience and aesthetic appeal are mainstream ideas accepted worldwide…. First of all, I believe that Han clothing is an important TRADITION of the Han people, and I think the ancients would agree with me on that. Tradition means, “the transmission of customs or beliefs from generation to generation, or the fact of being passed on in this way.” For the Han people, the wearing of Han clothing is a custom, and is worthy of being passed down. What this also means is that the Han people would never make drastic changes to the clothing, and if they did, it had a function/purpose and was unique. Each dynasty managed to develop their own Han clothing designs yet at the same time, preserved the older ones. The clothing customs did not really change for thousands of years. The people had the same ideas as to what is functional/comfortable/aesthetically pleasing. I guess I’ll start with that. I am in the line of thinking of certain sets of clothing should not have a modern version and should stick to tradition (like the Shenyi), while everyday clothing can have designers added to it to it as long as it does not go too far into left field. Which is similar to Tang and afterwards stopped using the shenyi for the most part, they didn’t want to ruin the tradition and meaning behind it (though most of it is kinda lost). Speaking of which, is there any good examples of Tang dynasty clothing? Tyler Vipperman: Well, the common people pretty much wore the same clothing throughout the ages. From the Tang dynasty onward, round-collared robes become a lot more popular, however, cross-collared robes were still worn a lot. Also, the designs from the Tang to the Ming dynasties weren’t really drastic. One could say that the introduction of round-collared robes in the Tang dynasty was the most drastic change. Han people became a lot more open in the Tang and Song dynasties and then went back to being more modest in the Ming dynasty, and the designs reflect that. Juni L Yeung A restored tradition, as the movement pundits call it. Tyler Vipperman, I must disagree with you on this perception: Back in 2003, there WAS no tradition of hanfu (unless you count opera costumes) in Chinese society, mainland or otherwise. 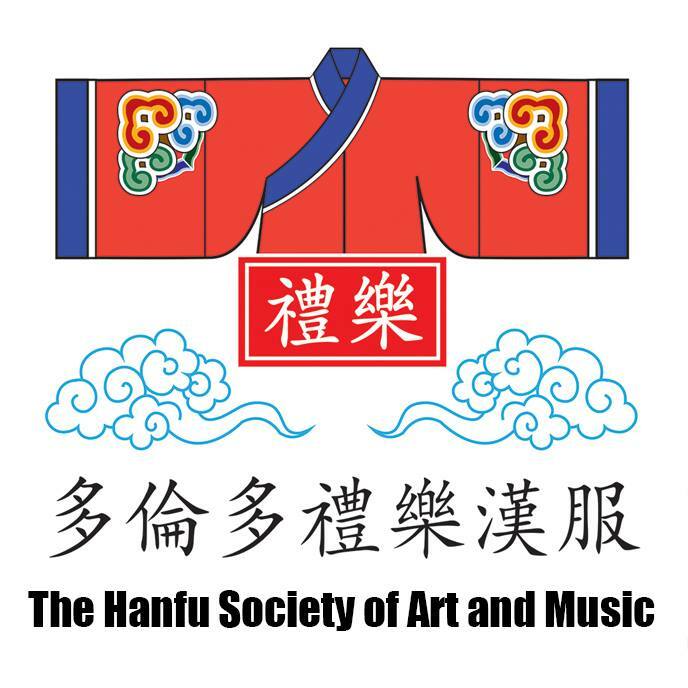 We must come to realization (even if only partially) that hanfu (the dress) and its appending culture (“the movement”) is the work of Anderson’s reimagined community (international collab of “Hanists”), forging a new invented tradition. Similar to all other cases of such reimagined communities, they stake claims to a greater tradition in order to gain grounds for legitimacy of their existence, and even greater legitimacy by realizing and admitting of their conscious effort is something totally new. anything other than what is presented to him in the given moment. — “The Schema of Mass Culture,” in Theodor Adorno, The Cultural Industry. Ng Vincent: yea but we still call Tang dynasty styles hanfu even with slight changes. I myself dont get some of the not hanfu threads here and there for any slight changes. Though drastic changes I do agree should not be allowed. I also dont know how to get away from labeling styles by dynasties being the styles from Pre-Tang is so different from Tang and afterwards…. Tyler Vipperman: Certainly that’s true. But what is the purpose of this movement then, Juni L Yeung? Is it not to revive the traditions of the ancestors who died protecting it? Or it just for fun? I’m interested in hearing other peoples opinions on this matter. Juni L Yeung: ^ Ng Vincent: Read my above post. The short: You’re having huge assumptions about what “being Tang” means. “Tang-ness” is a visual cue, stereotyped inside your mind and a common construct of the “modern mind,” commodified and commensurate amongst other people (like us Hanfu connoisseurs, and on a very different meaning for those who have an inkling about the imagery of China throughout the ages). I am suggesting that this is problematic, although this is the very nature of how the fashion industry works. Tyler Vipperman: It is from my understanding that the ancients had a very deep, rich connection with their ancestors and that they would rather die then to lose it. (in most cases). New traditions can’t be made without a cultural structure existing. Now, the structure isn’t there, and we have to rebuild it. We’ve tried swallowing “tradition” in different ways – wholesale (“Everything from Huang Di to Ming!”), selected specific (“Zhou/Tang/Ming supreme!”), to nihilistic (“Anything goes as hanfu!”), but none of them have completely suited our needs. If a given structure isn’t working, then there must be something that it cannot support – the question is, what is it, and should we do? Obviously, any of the systems above alone cannot describe the needs of our time. The legacy of the past decade is, we’ve established our own system of objects by functional categories (dynasties in the past wrote books on its conventions, like we have), but in our case, the categories are much broader in that we have a far larger asset base to cover, and it strokes certain people in the wrong ways as it’s “different” to the methodologies or ideals of certain prescribed pasts. Ng Vincent I think that there is no way to prevent modern society and fashion industry in changing styles to fit modern styles or what ever the tailor wants to add/change based on anything. I kinda think Tang dynasty had it right, they didnt try to stop all of the changes, a everyday person like a farmer does not care what is proper they just want clothing to keep them protected and presentable. They only did it on only on certain clothing that had meaning to it like the shenyi. Plus it is only to the learned people that it had any meaning. A kimono is in the same category, they let the single layer alone for everyone to wear and let the fashion world mess around with it. But court clothing is regulated and kept to tradition with little changes except fabric design. Tyler Vipperman: It starts within. We have to rekindle our connection to the ancestors, study their teachings/way of life. There is a reason why the China of the past was so great, and we need to search for that reason. In this modern world, we can do what the ancients couldn’t. Society is a lot more open and a lot of ideas that the ancients didn’t agree with can finally be implemented. They had a lot of things right, and also a lot of things wrong. I believe that Han culture can be improved upon and instead of “Huang Di to Ming!”, it can be “Huang Di to NOW!” (minus Yuan, Qing, and ROC). Actually, you’re wrong about that Ng. Even a farmer had a strong cultural backbone in ancient China. They were very proud of their culture/country and had their own commoner customs/culture . Even a farmer did their Guanli, took part in ceremonies/rituals (if possible), and supported the country in whatever way they could. They believed the country belonged to the people and it was the governments responsibility to protect it and make their lives better. Everyone followed some sort of etiquette when possible, no matter what class they were in. But yeah, a farmer was typically a lot more open since farming is a difficult job. And you know, a lot of peasants ended up becoming generals in the army, scholars, etc. Juni L Yeung: More problems! Vincent: More imaginations. The phenomenon of changing styles has always been present in Chinese dress history – if you’re Antonia Finnane, you’d even argue that there’s a “fashion phenomenon” in the late Ming, replete with consumerism, posh and bling and everything. The problem lies today that there is NO INSTITUTIONAL CONTROL over the category of hanfu, where the PRC government consciously made the decision of free reign (if not deliberate distancing) over the boundaries of what this dress is. This opens possibilities as well as problems, and what the movement is trying to do is a brilliant turn of events as the category of hanfu is no longer hegemonized by an imperial order, allowing, if you have faith in modern liberalism, great potential in diversity. Our definition would look nothing like any of our past eras, and that’s what we’re striving for. Although you COULD argue that the new institution is the Cultural Industry, which is less than satisfactory now – they consist of cheap Taobao cosplay costume makers, us hanfu pundits and Confucian researchers, and the makers within it. You can see how messy this “institution” can get. Juni L Yeung I think what the Internet has empowered the social group that is the hanfu movement to see is, that no institutional policy written up by the PRC, ROC, or any future regime (no matter how Hanist/Han friendly) will have a sufficiently satisfactory definition. Perhaps it’s my Western liberalism at work here, but I celebrate the freedom and reflexiveness being a deregulated practice at the moment, and if an institution is to be formed, it must “represent the people’s wishes and ideals,” so that at any point when we have a new revelation/understanding, we’d be able to update ourselves in the most aware, expedient manner. Or should I spell it out? *gasp* DEMOCRACY! Tyler Vipperman: Good idea, Juni L Yeung. There is also the problem of people wanting stupid things, though, but it can be dealt with. That’s probably the only problem with democracy. Perhaps we could come up with a Chinese version? Ng Vincent: Well for people back then didn’t have much of a choice back then everything was correct, there was no movie clothing or inaccurate clothing unless you get into the shenyi or any clothing that was ultra traditional. I bet the term hanfu was either made modern day or around Qing dynasty times when hanfu slowly went out of the clothing style. As of today, well taoist and monks clothing is pretty much set in stone because you look stupid if you try to be different. But for everything else it is movie clothing is what is throwing everything out of wack. Then you add in modern day people has little to no clue on how a hanfu should look like, all they care is if it looks good… or if they can look like that movie they just saw. That is unless you are ultra traditionalist like most of us in this group. Tyler Vipperman: Actually, the term “Hanfu” had already been in use in scrolls since the Han dynasty? I think. Ng Vincent: yea, but everyday people dont use the term hanfu. Tyler Vipperman: Yeah, because it was normal. Western people don’t say “I’m wearing Western clothing”, right? They’ll say they are wearing a t-shirt with pants, or a tux, or a suit, or something like that. The term Hanfu is only used when explaining it to foreigners. China was actually called 華夏 in the past. Ng Vincent: Yea, you just call it clothes. Unless you start to refer to a certain period of clothing then you add xxxx period, kinda like hanfu. So in my opinion I say Ming Hanfu works fine…. but it does create segregation of hanfu which Juni L Yeung wants to prevent. 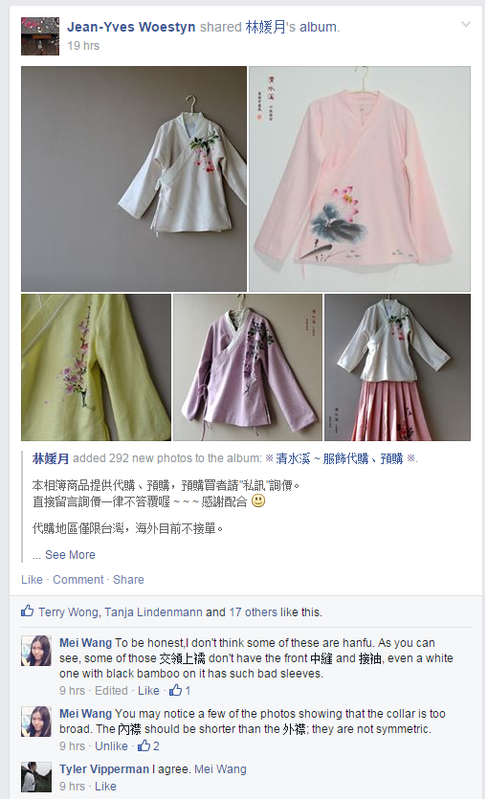 Tyler Vipperman: However, Hanfu isn’t period clothing. It is the clothing of the Han people. The mandarin collar from the late Ming could be considered period clothing, though.Dynasties lasted for hundreds of years and new clothing designs in any Han-ruled dynasty would just be added to the clothing tradition of the Han people. Some developed throughout the ages and some stayed the same. Juni L Yeung: ^ Not unless you recapitulate into feeling comfortable making dynasty names from now on being “hyped labels,” commoditized for sale. It may be inescapable, or inevitable. There’s this imagination that the past had this golden standard that stood unfazed and permanent. IT DOESN’T EXIST. Read Antonia Finnane’s chapter on late Ming Jiangnan cosmopolitanism. The scholars’ constant bemoaning of “Fuyao” (deviant dressers) and women competing in new styles in an accelerating pace is a sign that the issues of modernity is not something only our past few generations had to deal with. Tyler Vipperman: That’s true, Juni L Yeung. Fashion battles were quite popular among the female elite…however, I don’t like that kind of behavior. It just seems silly to me. Yes, there are many different forms of the Shenyi. It’s really interesting. Juni L Yeung: ^ Tyler, not just “many different forms of Shenyi,” but an EVOLVING form over the ages. This is not just a matter of showing difference, but progress and change. Ng Vincent: Basics of some clothing does not change much, once you get the guidelines set (if one knows the guidelines or is still in practice), one can still add elements to fit their own style or elements of the current fashion (minus fitting differences). That is as long as one does not look too weird when set with other people of their time. Kinda like you are not going to wear a colored shenyi to a white/black shenyi event akin to wearing a colored tuxedo to a formal black and white tuxedo event. Still in general, the Shenyi has not gone though the hyper changes of the day to day fashion like other hanfu clothing has, which as you stated Juni L Yeung like womens clothing seems to have changed drastically. Clothing evolves, so I see that some clothing have more rules while some clothing has less rules. Which I think it is best to prevent wanton changes due to a movie/fashion hype so we wont see movie clothing like shoulder padded guards that pop up an arms length then worn for a hanfu get together but yet also allow for changes for fashion. Tyler Vipperman: That’s exactly right, Juni. If you look at all of the different Shenyi, you’ll see that they also have a lot of similarities. They are all full of symbolism and were made with a purpose in mind, and that’s what makes Hanfu different from modern fashion, which typically only focuses on the aesthetic aspects of the dress rather than function and symbolism. Brighid Wu: Of course, I’m no hanfu scholar. But is respectfully submit that the problem in much of this is less to do with the typologies of form changes in hanfu through history than the discontinuity in the quotidian deployment of hanfu leading to its creation. That is, it is the pattern language of the tradition lay less in some orthopractic standard than in the polysemic interpretations of custom creating a communal “open set” in what the sartorial tradition was in any given era and place. So of course one can really only speak of hanfu in the current era, as there is a “not-hanfu” which is being turned from. That doesn’t mean there wasn’t a tradition. It’s clear even to my uneducated eyes that there was a set of sartorial practices that helped the amorphous central culture of the empire define itself. Otherwise, the Qing would not have imposed their harsh sumptuary edict.But on another level, perhaps the Qing was not such a discontinuity… No doubt each dynasty tried to secure its sartorial harmony just as they did with music, etc. whether or not they could enforce such sumptuary codes absolutely. The traditions were maintained by clergy and in theatre. But they, too reimagined and refined the tradition with each generation anew. (It’s not true that Daoist clothing is moribund. Today’s mass produced Daoist robes are almost nothing like what was worn 100 years ago. There is an archaicizing and stereotyped dimension to today’s Daoist custom which plays against and yet also reinvents the received tradition just as in the hanfu movement, really.). So, I’d offer that what is really at stake is not the question “what makes hanfu”, but rather, “what doea hanfu empower?” To my feeling, the extractive, liquid, consumerist fashion imperative to which Juni invokes Adorno is the real danger. One can wear all the embroideredsilk one likes, but if one doesn’t embody the discussion of the ontological dimensions, in all their contradictions and multifacets, then one is just doing historical cosplay. It matters less to my mind what those readings are than that it is done at all in defiance of the engines of postmodern late capital ripping from us all shreds of unmonetized meaning by mining symbols into dust. (Daoist traditional clothing has radically different historicity in reading the tradition than the scholars’ classicizing view. This is not troublesome, as it is just 感應 at work.) So this is the meandering way of saying I hope hanfu can move from the archeological phase to a more sophisticated and polysemic discourse in which the tradition is trusted to bear elasticity with healthy resilience. Tyler Vipperman: Well, the modern version is basically just a mix of Han clothing and Manchu clothing with some buttons on the collars…I think we can come up with better Daoist clothing. Tyler Vipperman: Yeah, martial arts were popular in ancient China too. What did they wear? Well, clearly they wore something that was loose and comfortable (typically a mid-sized/long cross-collared/round-collared robe with a belt, and whatever accessories you wanted, such as wrist protectors, boots/shoes, socks, etc). And yesa was popular in the Ming dynasty, and that was convenient, loose, and comfortable.